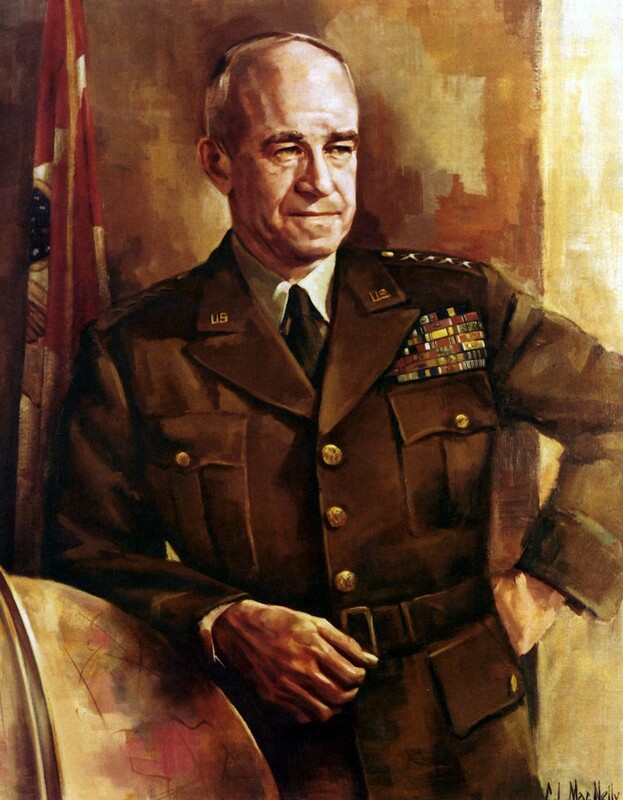 Omar Nelson Bradley was born in Clark, Missouri, on 12 February 1893. He graduated from the United States Military Academy in 1915, was commissioned a second lieutenant, and assigned to the 14th Infantry. In 1916, he married Mary Quayle and was promoted to first lieutenant. From 1915 to 1919, he performed troop duty in the West. In 1917, he was made a captain and then a temporary major. In 1919 and 1920, Bradley served on Reserve Officer Training Corps duty in Minnesota and South Dakota. He then taught mathematics at West Point for four years before graduating from the advanced course at the Infantry School at Fort Benning in 1925. He served with the 19th and 27th Infantry Regiments in Hawaii until 1928 and commanded the Reserve and National Guard components there. In 1929, he graduated from the Command and General Staff School at Fort Leavenworth. Bradley taught tactics and weapons at Infantry School from 1929 to 1933. In 1934, he graduated from the Army War College, and taught tactics at West Point for the next four years. In 1936, he became a lieutenant colonel and served as the chief of the Operations Branch, G-1, War Department headquarters from 1938 to 1940. He was promoted to temporary brigadier general in 1941. Bradley was the commandant of the Infantry School and established the Infantry Officer Candidate Program in 1941 and 1942. In 1942, he became a temporary major general and then a temporary lieutenant general in 1943. During this time, he led the 82d and 28th Divisions, then commanded II Corps in North Africa and Sicily. In 1943, he was made a permanent brigadier general, and a permanent major general in 1944. Bradley commanded First Army and then 12th Army Group in Western Europe after the Allied Normandy invasion. In 1945, he was promoted to temporary general, which was made permanent in 1949. After the Second World War, Bradley headed Veterans’ Affairs until 1947. He served as Army Chief of Staff from 7 February 1948 to 16 August 1949. Bradley became the first Chairman of the Joint Chiefs of Staff under the reorganization of the armed forces, and served in this capacity from 16 August 1949 to 16 August 1953. In 1950, Bradley was promoted to General of the Army and was the first chairman of the Military Staff Committee of the North Atlantic Treaty Organization. In 1966, he married Esther Dora Buhler. Bradley died in New York City, on 8 April 1981.